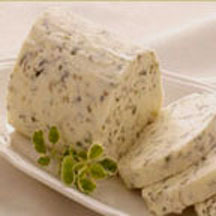 Serve this herb-flecked butter on everything from mashed potatoes to dinner rolls. It's also wonderful for rubbing under the skin of turkey and chicken. Heat 1 tablespoon of butter in a small saucepan over medium heat. Add the shallots and season with a pinch of salt. Sauté until soft, but do not brown. Add the vermouth, and simmer until the pan is almost dry. Set aside to cool completely. Place the butter in a medium mixing bowl and, with an electric mixer (fitted with the paddle) or wooden spoon, beat until light and fluffy. Scrape down the sides. Add the marjoram and pepper, and beat to incorporate, scraping down the sides. Add the cooled shallot mixture and beat to combine. Taste for salt and pepper. Scrape into a small bowl, serving crock or butter molds and cover tightly; or shape into a long roll in grease-proof paper (plastic, wax or parchment) for storing and slicing as needed. *Shop for fresh marjoram in the herb section of the produce department; dried will be with the spice section.